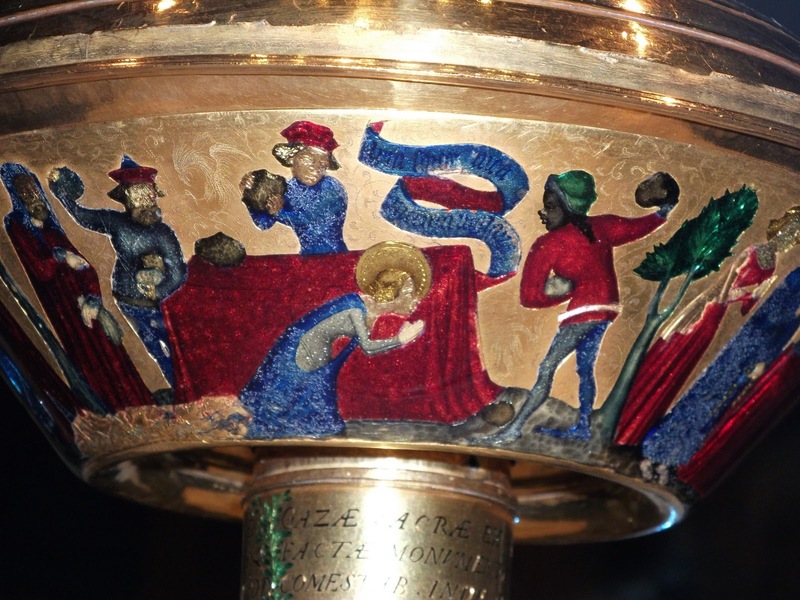 The feast of St Peter’s Chair was originally kept on one of two dates. Some sources, going back to the fourth century, attest to it on January 18th, among them, an ancient Martyrology formerly attributed to St. Jerome. Others place it on February 22nd, such as the Philocalian Calendar, which contains an equally ancient list of liturgical celebrations. It is not at all clear why exactly the same feast is found on two different dates, and even less clear why a surprising number of early Roman sacramentaries and lectionaries make no reference to it at all. However, in the later Middle Ages, the January 18th observance had been completely forgotten, and the liturgical books of the period before the Council of Trent, even those of the Ambrosian and Mozarabic Rites, are unanimous in keeping the feast on February 22. In 1558, Pope Paul IV, (pictured right) a strong promoter of the Counter-Reformation, added a second feast of St Peter’s Chair to the calendar, on January 18; a response, of course, to the early Protestant Reformers’ rejection of the governing authority of the see of Peter and the bishop of Rome. The newly restored feast was assigned to the day given in the ancient manuscripts, particularly the Martyrology “of St. Jerome,” which the scholars of the era regarded as an especially important witness to the traditions of the Roman Church, where Jerome had once live and served as secretary to the Pope. 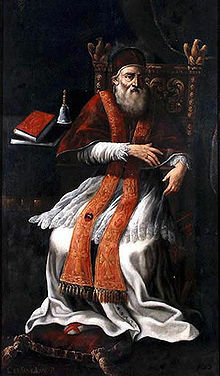 Although it was then a very new custom to keep two feasts of St Peter’s Chair, both were included in the revised Breviary called for by the Council of Trent, and issued at Rome in 1568 under the authority of Pope St Pius V. January 18th was now qualified, in accordance with the evidence of certain manuscripts, as the feast of St. Peter’s Chair in Rome, while February 22 was renamed St Peter’s Chair at Antioch, where the Prince of the Apostles was also the first bishop, and where “the disciples were first given the name Christian.” (Acts 11, 25) It should be noted that although the January feast was the more recent in terms of the liturgical practice of not just Rome, but the entire Latin Rite, the more important of the two titles is assigned to it, rather than to the better-established feast in February. January 18th falls eight days before the Conversion of St. Paul; the restoration of a feast of St Peter to this day was also certainly intended to reinforce the traditional liturgical association of the two Apostolic founders of the church in Rome. The early Protestants claimed justification for their teachings in the writings of St. Paul, several of which became for Luther a “canon within the canon” of the Bible. The two feasts, therefore, form a unit by which overemphasis on Paul is corrected by a renewed emphasis on the ministry of Peter. In accordance with the same tradition, the Use of Rome has always added to each feast of either Apostle a commemoration of the other; thus, the eight day period from January 18 to 25 begins with a feast of Peter and commemoration of Paul, and ends with a feast of Paul and commemoration of Peter. The same day is also the feast of St Prisca, who remains in the Tridentine Breviary as a commemoration. It is possible, though by no means certain, that an ancient relic believed to be the actual chair of St Peter was first kept at or near the same catacomb where this obscure Roman martyr was buried, and later moved to the church on the Aventine hill dedicated to her. This basilica keeps its dedication feast on February 22; it is probably more than chance that both the feast and the dedication of St Prisca should be on days associated with St Peter’s Chair. The former cathedral of Venice, San Pietro in Castello, also claims to possess a chair of St Peter, that of Antioch. Laying aside the question its authenticity, the writing on it is certainly Arabic, and of the 13th century. The Breviary of St Pius V also added on January 24th a feast found in many medieval liturgical calendars, which, however, had not previously been kept at Rome itself, that of St Paul’s disciple Timothy. The addressee of two of the Pastoral Epistles, and the Apostle’s companion in so much of his missionary work, St Timothy is very often called an Apostle himself in medieval liturgical books, as is St Barnabas. In the Tridentine Breviary and Missal, he is given the titles Bishop and Martyr, since he was beaten to death by a mob in his episcopal city of Ephesus, many years after St Paul’s death. His feast forms a kind of vigil to the Conversion of St Paul; by this addition, each of the two great Apostles is accompanied, so to speak, by another Saint prominently associated with him. Whether by coincidence or design, an interesting group of feasts occurs between that Ss Peter and Prisca on the one end, and Timothy and Paul on the other. January 19th is the feast of a group of Persian martyrs, Ss Marius and Martha, and their sons Audifax and Abacum. They were said to have come to Rome in the reign of the Emperor Claudius II, (268-70), and after ministering to the martyrs in various ways, were themselves martyred on the Via Cornelia by decapitation. January 20th is traditionally kept as the feast of two Saints who died in Rome on the same day, but many years apart. 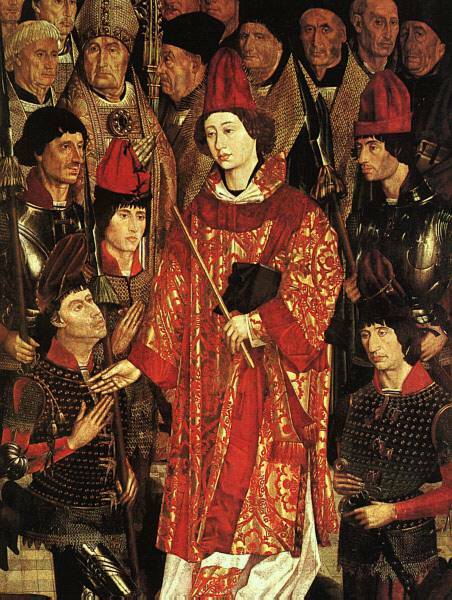 The first is Pope Fabian, who was elected in 236, although a laymen and a stranger to the city. According to Eusebius (Church History 6, 29), he entered the place where the election was being held, and a dove landed on his head; this was taken as a sign that he was the choice of the Holy Spirit, and he was forthwith made Pope. Fourteen years later, at the beginning of the first general persecution under the Emperor Decius, he was one of the first to be martyred. 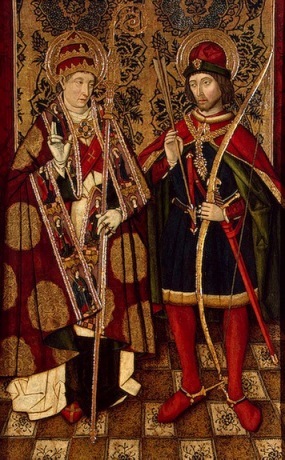 He shares his feast with St Sebastian, said to be a soldier of Milanese origin, as attested by St. Ambrose himself, but martyred in Rome in 286. The relics of St Fabian are kept in one of the chapels of the Roman basilica of St Sebastian, built over the latter’s grave in the mid-fourth century. On the following day, the Church has kept since the fourth century the feast of one of Rome’s greatest martyrs, St Agnes, who was killed in the persecution of Diocletian at the age of twelve or thirteen. She is named in the Canon of the Mass, and a basilica built near her grave was one of the very first public churches in Rome, a project of the Emperor Constantine himself, along with those of Ss Peter and Paul, the Holy Cross, and St Lawrence. St Vincent of Saragossa, another martyr of the last general persecution, has long been held in a special place of honor by the Church, along with his fellow deacons Ss Stephen and Lawrence, all three of them having been killed in particularly painful ways. The church of Rome added to his feast on January 22 a martyr from three centuries later, St Anastasius; he was a Persian who converted to Christianity after seeing the relics of the True Cross, which had been stolen from Jerusalem by the Persian king. This is a proper custom of the city of Rome itself; I have not found his feast in any other pre-Tridentine liturgical calendar. A church was built in his honor by the middle of the 10th century, directly across from the future site of one of the city’s most impressive monuments, the Trevi Fountain. To sum up, therefore, Peter is accompanied by a Roman martyr, Paul by a martyr of one of the oldest Greek churches, that of Ephesus, where both he and St John the Evangelist had lived and preached. Between their two feasts are celebrated martyrs from the two extremes of the Christian world in antiquity, Persia and Spain; native Romans, one the highest authority in the Catholic Church, and one the least and last of its members; a Roman soldier from the venerable see of Milan, representing the might of the Empire, subjected to Christ; and a young woman who in the pagan world was a person of no standing at all, but in the Church is honored as one of its greatest and most heroic figures. The eight day period from January 18-25, then, becomes a celebration not just of the two Apostles who founded the church in the Eternal City, but of the universality of that church’s mission to “preside in charity” over the whole Church, as St Ignatius of Antioch says, and bring every person of whatever condition to salvation in Christ.